2018 Swim Team Registration Open Now! It’s not too early to register for this summer’s swim team! 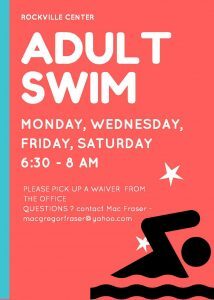 Swim team is available for members 18 years and younger. It’s a great way to strengthen your child’s swimming skills and meet new friends! Registration form attached here. If you have any questions, please contact our swim team manager, Nicole Rada at rockvilleracersteam@gmail.com. Posted in Uncategorized	| Comments Off on 2018 Swim Team Registration Open Now! 2018-2019 membership forms are available now. We are pleased to announce we are keeping 2018 membership fees flat from last year. Once again, we are offering a $100 referral refund for any new members you refer (payable upon receipt of payments received by both existing member and new member). Limit of one refund per existing member. Payment due by April 30, 2018. 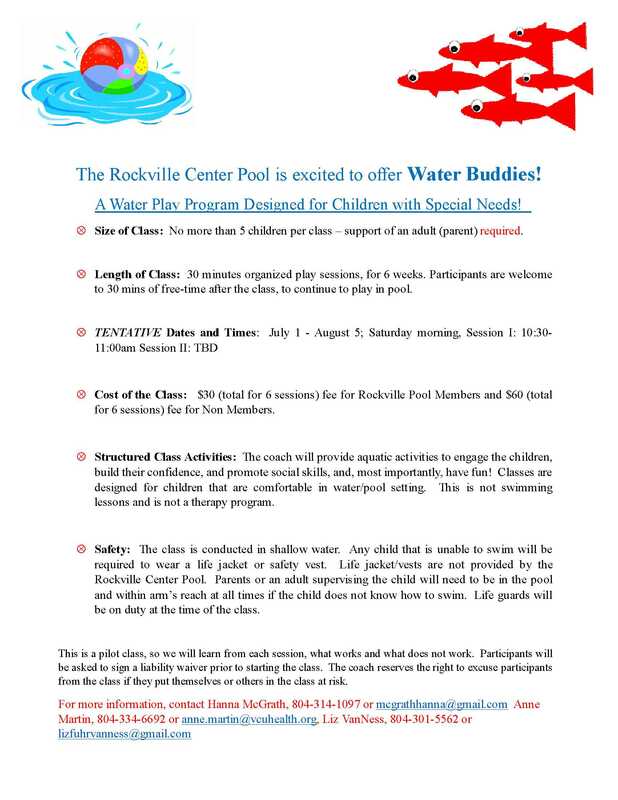 If you have any questions, please email us at membership@rockvillecenter.com or call Jennie Burcham @ 804-749-3731. Below is a snapshot of our August events. A .pdf of the calendar is also attached below if you want to down load and print it off. Tuesday, August 1, 2017. South Anna Elementary School Staff Appreciation Day. All SAES staff members are invited to come out to the pool to enjoy a day of sun and relaxation. You do not need to be a member to join us. Please sign in at the gate and pay $5 guest fee. Friday, August 4. 6:00 pm. Float Night. Sponsored by BHK Catering. The Kona Ice Truck will be here from 6:30 to 8:00! Sunday, August 6th. 3:00 pm. Sundae Ice Cream Social. Sponsored by Edwards Jones. Please bring a topping to share. Friday, August 11th. 6:00 pm. Float Night. Pay $1/float at gate. Honor system. Friday, August 18th. 6:00 pm. Float Night. Pay $1/float at gate. Honor system. Friday, August 26th. 6:00 pm. Float Night. Pay $1/float at gate. Honor system. 4th of July Potluck Picnic, Tuesday, July 4th, Noon to 3:00 p.m. Please join us Tuesday, July 4th for our annual 4th of July Picnic! Hamburgers, hot dogs, and lemonade provided by the Center. Sign up at www.perfectpotluck.com, under find, type rockvillecenter, under password type 2779. 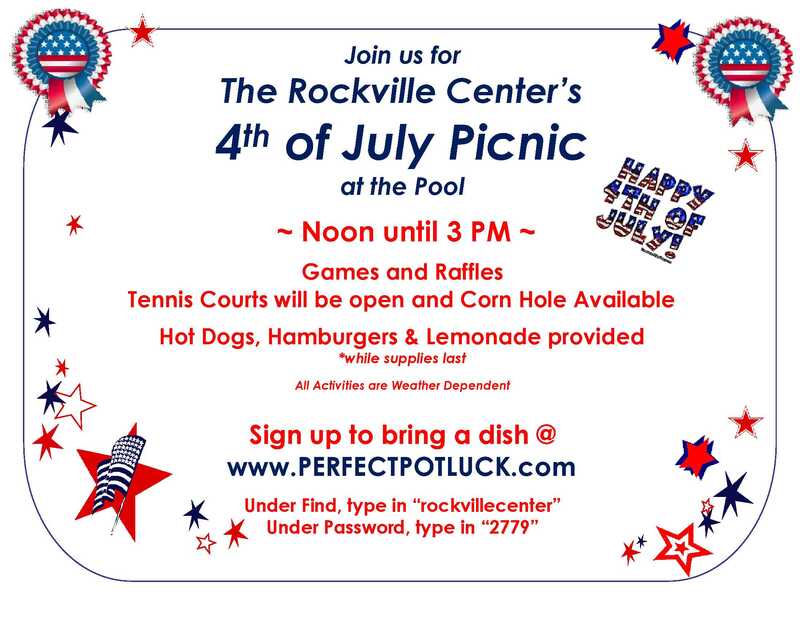 Posted in Uncategorized	| Comments Off on 4th of July Potluck Picnic, Tuesday, July 4th, Noon to 3:00 p.m.
Below is a snapshot of our July events. A .pdf of the calendar is also attached below if you want to down load and print it off. Tuesday, July 4th Noon til 3:00 pm. Old-Fashioned 4th of July Potluck Picnic. Burgers and hotdogs provided. Bring a dish to share. Friday, July 7th. 6:00 pm. Float Night. Friday, July 14th. 6:00 pm. Tomato Pie Party on the Patio. Bring your favorite tomato recipe to share. Friday, July 21st. 6:00 pm. Pizza on the Patio. Join us for a slice of pizza, a sweet treat and a drink. Friday, July 28th. 6:00 pm. Float Night. Here are our 2017 Pool Hours. See you there! 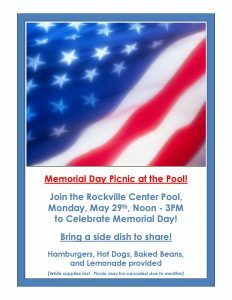 Memorial Day Picnic, Monday, May 29th, Noon to 3:00 p.m. Please join us Monday, May 29th for our annual Memorial Day Picnic! Hamburgers, hot dogs, beans and lemonade provided by the Center. Posted in Uncategorized	| Comments Off on Memorial Day Picnic, Monday, May 29th, Noon to 3:00 p.m.
Water Buddies is a water play program designed for Children with Special Needs. Size of Class: No more than 5 children per class – support of an adult (parent) required. Length of Class: 30 minutes organized play sessions, for 6 weeks. Participants are welcome to 30 mins of free-time after the class, to continue to play in pool. 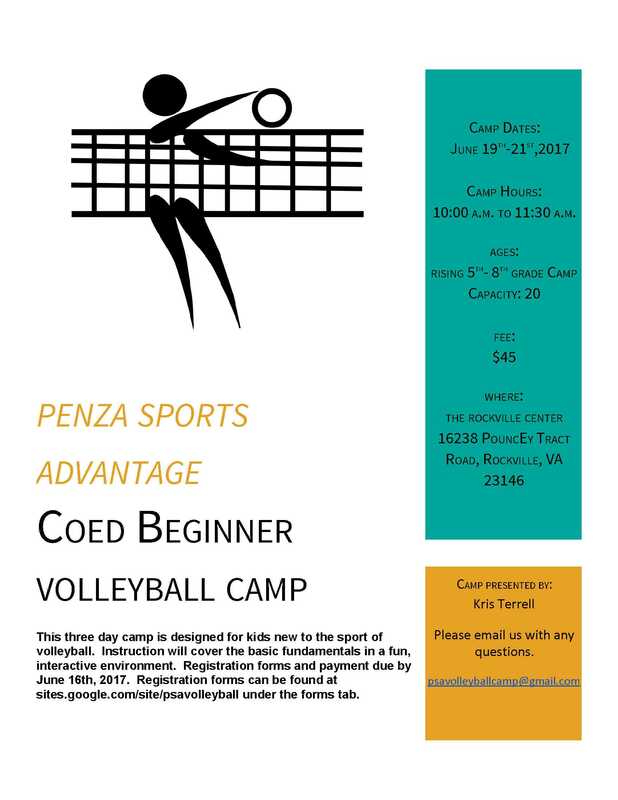 Cost of the Class: $30 (total for 6 sessions) fee for Rockville Center Members and $60 (total for 6 sessions) fee for Non Members. Structured Class Activities: The coach will provide aquatic activities to engage the children, build their confidence, and promote social skills, and, most importantly, have fun! Classes are designed for children that are comfortable in water/pool setting. This is not swimming lessons and is not a therapy program. Safety: The class is conducted in shallow water. Any child that is unable to swim will be required to wear a life jacket or safety vest. 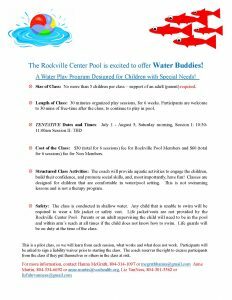 Life jacket/vests are not provided by the Rockville Center Pool. Parents or an adult supervising the child will need to be in the pool and within arm’s reach at all times if the child does not know how to swim. Life guards will be on duty at the time of the class. This is a pilot class, so we will learn from each session, what works and what does not work. Participants will be asked to sign a liability waiver prior to starting the class. The coach reserves the right to excuse participants from the class if they put themselves or others in the class at risk.